When we first obtained these plants they were unlabeled, but we've been told by others that it is the cultivar 'Fireworks'. The red color various according to the time of year and the conditions. It continues to be dry with no rain in the forecast, but the nights are beginning to get cooler (mid 40s F). Tomorrow, though, we should have another nice, sunny day in the mid to upper 70s (F). Ideal. To give you perspective, this tomato plant ("Yellow Canary") is being grown in a 4 inch diameter pot (about 10 cm.). As you can see, it's very small...and very prolific. As a plus, the tomatoes are luscious. It isn't just the flowers which attract me to cacti and other succulents. For some, this may just look like so many bugs, but to me, it shows the strange beauty of these plants and the amazing ways in which they have been able to adapt to a difficult environment. 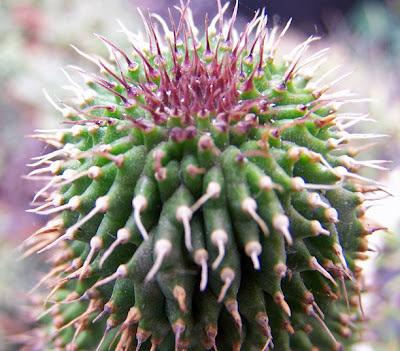 This came to us as Trichocaulon flavum, but it appears that Hoodia flava is now favored. No flower to show off, just the new growth. We've also had lots of Pleiospilos flowers lately, but I haven't been very good at having the camera handy. Yesterday I posted a picture of a small offset of this plant; this is a larger, more mature plant. The pink edges vary with the growing conditions, of course, and with the time of the year. Even as tiny little starts, the coloration on this cultivar is already amazing. Unfortunately, Agave attenuata isn't one of those hardy agaves that we can grow outdoors, but this relatively new cultivar is worth growing as a potted specimen and providing some winter protection. It's called 'Ray of Light'. There are A. attenuata plants with more splashy variegation, but in my opinion this one has just the right amount of white, giving it a real elegance. Lynn-Marie got more pictures than just me bending over in the pond. But continuing with the water theme, she took some new photos of Echeveria 'Aquarius' which I thought you might enjoy. Well, OK, it's not really a "self" portrait. Lynn-Marie sneaked up on me a couple of days ago when I was installing a new waterfall pump in the pond. She told me I had to include it on the blog because having someone in the picture increases the interest. All I've got to say is ... tables can be turned! Today, back to succulent plants. Without much of any sign of what it's going to become, these are Echeveria colorata seedlings. They've been getting some nice growth this summer; our mild summers are actually helpful for the Echeverias. The cold and wet which will be here soon enough...that's another thing. We'll face that when it arrives. In the meantime, we're enjoying another week or more of nice summer weather, with daytime highs in the upper 80s F (31-32 C). 68,000 square feet packed with books. We buy 3,000 used books over the counter every day. Approximately 3,000 people walk in and buy something every day. Another 3,000 people just browse and drink coffee. We stock 122 major subject areas and more than 3,500 subsections. You'll find more than 1,000,000 volumes on our shelves. 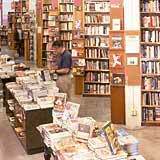 Approximately 80,000 book lovers browse the City's shelves every day in Portland and via the Internet. So is our mother ship the world's largest bookstore? Heck, it may be bigger than your whole town." 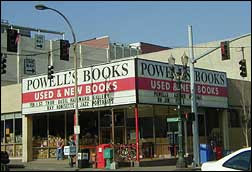 When you're in Portland - especially since our nursery isn't open to the public - you'll have to spend some time at Powell's! So...when you coming??? OK. I now know how to get a plethora of comments: get very tired and frustrated and threaten to just throw out all those tired old succulent plants. Honest, friends, it was just a threat from a tired old man. I promise, we will not toss any plant which would not be better served as compost than as a plant. Really. And if we ever do decide to have a fire sale or give away...you'll be the first to know. So, please, I didn't intend to cause any anxiety for anyone. You can relax. And regarding the weather, I should have noted that our lack of rain at this time of year is pretty much normal. From mid July through mid September, we seldom have any rain. I assure you, we will get our rain...lots of it. That's why I'm building a wooden walkway to the shed (hay and tool storage), so I don't have to slog through the mud during the winter months. 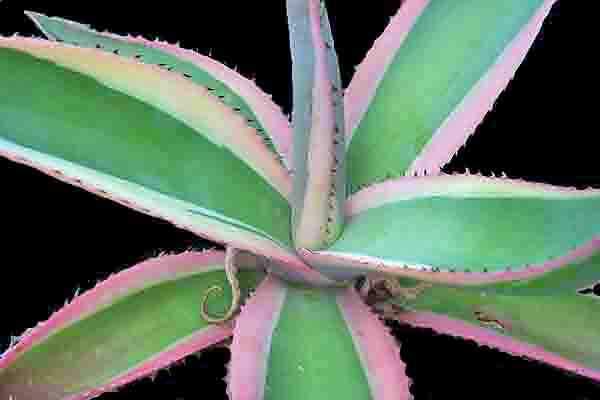 I'll conclude today with a picture of one of our Aloe polyphyla plants, also known as the "Spiral" Aloe. Enjoy your plants! This is just a sample of some of the plants which are still outside and will need to be moved back into the greenhouses ... somewhere in the greenhouses! As always, there's just not enough room. We will be tossing some plants, ones which we have plenty of and which people don't buy, no matter whether we like them or not. This is very hard for us to do, but sometimes it's just a necessity. The weather is continuing to be dry and beautiful, daytime temperatures in the upper 70s F and upper 80s (21-32C), nighttime around 55F (12.7C). We've only had a trace of rain since the beginning of August (and 1/4 inch [.65cm] since the beginning of July). But soon the rains will return. I think it must be, at least in part, because of the high demand for these plants that the cultivar names multiply like rabbits (or mealybugs! - on other people's plants, of course). These particular plants had more intense and deeper red when being grown in Southern California, but are a little less intense in our climate. Whatever their names, they're deservedly popular. I posted this earlier this summer when flowering, but now, just a closer look at the spines. For those of you who follow the nursery, you may have noticed that we've decided to take a "vacation" from orders for a bit. We're not going anywhere ... unfortunately - but we're just swamped with too many things right now, and we can't do justice to the nursery. We're still working in the nursery, cleaning out and getting rid of many plants which we no longer wish to have in our inventory. But we'll also be taking some personal time for renewal...maybe even do some camping or a small trip. We'll keep you updated. And I'll have some more photos pretty soon. This species is seen as highly variable and this has led to many names. "furfuraceus" is no longer accepted as a variety by most, but these are grown from seed of plants thus identified. There are those plants that are so easy to reproduce that become viewed as "common" and therefore are ignored. This is one of those plants. Each new "thimble" can easily break loose and root, thus forming a fast growing mound of cacti. But just because it's easy to grow doesn't mean it should be ignored. 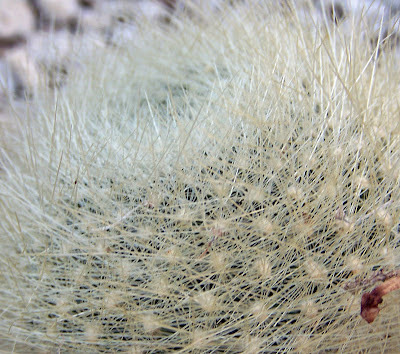 Even the experienced cactus grower can enjoy the challenge of creating a showy mound of these plants, presenting it in an appropriate pot and making an impression on even the most jaded cactophile! A bit of an oddball for a houseplant, but if you tend toward the strange, this is one of those. Noted for the single set of two large, semi succulent leaves. The bulb is generally raised up for additional interest. And, as a plus, it's very easy to grow. This is a wonderfully easy plant to grow, doing just as well on a windowsill as in a greenhouse (or, outdoors, where that's possible). According to internet sources, this is a cultivar of Gasteria obtusa and the Japanese name means "Snow of Mount Fuji". There are many variegated Gasterias, but this one is quite distinctive. Just a miscellaneous shot of some plants in the back yard. Nothing special. I'll try to get some new photos tomorrow. We've been growing cacti for over 40 years now and my interest in the Copiapoa genus has grown with the years. Copiapoa haseltoniana is a good example of why. The yellow to gold spines with a amber-yellow crown of wool and flowers from a young age are all elements which recommend it. It also clumps with age, making a great exhibition plant. Keep the plants warm and dry in the winter, avoiding any frost, and giving it plenty of light. Provide a potting mix with very good drainage and it will reward you with years of enjoyment. A little break tonight with a photo of some late season raspberries which are coming on strong right now. I have a lot of them to pick tomorrow, plus our farrier will be out to trim Ladybug's hooves and I have to work with some orders we have received. It's going to get warm in the next couple of days - probably our last gasp before Fall. However, September is often our best month. These wonderful small succulents are impressive, even at a young age, but as they get older, they produce a caudex which makes the plants even more impressive. For small plants, they surely can steal the show. Check out these additional photos from our nursery list.